Just in time for Sunday Brunch…. The Bloody Mary Cocktail is a favorite choice of drink for brunch, and this dish was inspired by the popular cocktail that has been around since the 1920s. As with the cocktail, the highlighted ingredient is the Worcestershire Sauce, which has a pretty unique culinary history unto itself. For the most part, Worcestershire Sauce is condiment used to flavor meats, gravies, soups and of course, Bloody Mary Cocktails. Among the other ingredients, Worcestershire Sauce is also made up of vinegar, garlic, soy sauce, tamarind, onion and molasses. 1. Prepare the ingredients. Peel the onion and mince. Rinse tomatoes and dice into 1 inch cubes. Mince the garlic. Rinse shrimp and pat dry with paper towels, Rinse arugula. Rinse the celery and cut into 1/8 inch dice. 2. In a small pot, bring the jasmine rice, 1 1/4 cups water, and a pinch of salt to boil over high heat. Stir once,cover and reduce heat to a low simmer and cook for 12 minutes. Remove the pot from the heat and allow to stand, still covered for 10 minutes. Uncover, fluff with a fork and set aside. 3. To make the Bloody Mary Sauce, heat 1 tablespoon of olive oil in a large pan over medium heat. When oil is shimmering, add the onion and saute until soft and translucent. Add the tomatoes and garlic and cook until softened. Add horseradish sauce, Tabasco sauce, Worcestershire sauce, and 1/2 cup water and stir to combine. 4. Season the shrimp with celery salt and black pepper to taste, thyme, and the Old Bay Spice. Add seasoned shrimp to the sauce in the pan and cook until shrimp are pink and opaque, 1-2 minutes per side. Taste the sauce and adjust the seasoning with salt and black pepper as needed. Remove the pan from the heat and set aside. 5. To season the rice, add arugula to warm jasmine rice and stir to combine, allowing the arugula to slight wilt.Taste the rice and add salt as needed. In a medium bowl, combine celery, 1 teaspoon olive oil, and 1 squeeze of lemon juice. Taste and add salt and white pepper as needed. 6. To serve, divide jasmine rice and arugula evenly between two plates. 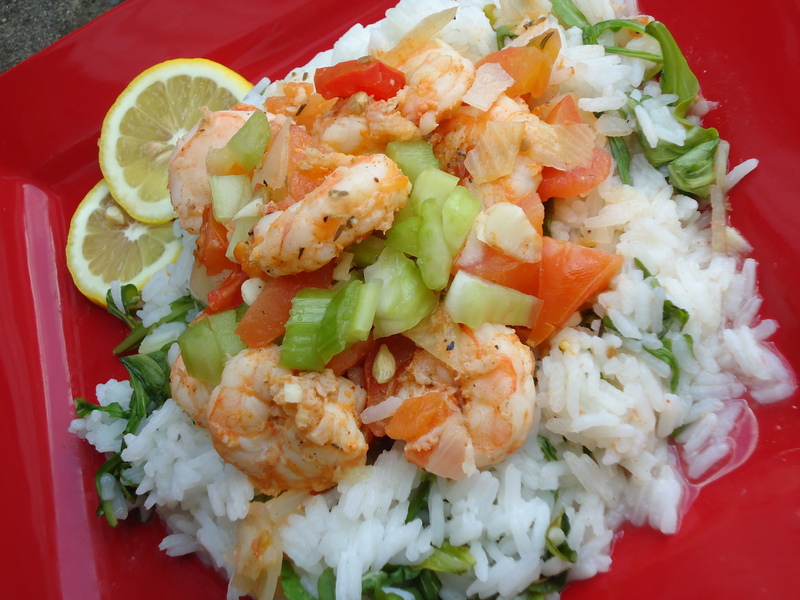 Top with shrimp and tomato sauce, Squeeze the juice from the other half of the remaining lemon over the shrimp and rice. Garnish with the celery salad and serve hot.